The Prana Crystal was originally created as a special order for Master Choa Kok Sui, well known healer and Master of Pranic Healing. As is our practice in the process of working with a new crystal form, I sent one of the Prana crystals to friend Melissa Applegate for her impressions. Melissa is a gifted intuitive and has done frequent consulting work for Marcel Vogel. She also sponsored two trips to Egypt for Marcel to assist in his completion of work at this sacred site. "This is the most amazing crystal I’ve ever had in my hand…it felt just like a Qi Gong machine. 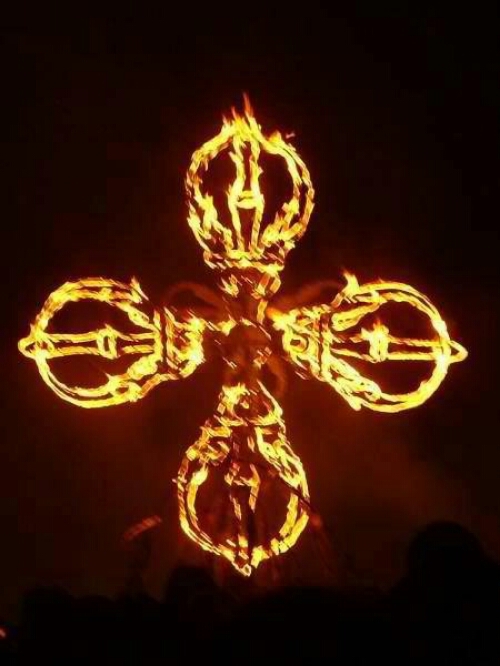 It felt just like working with an Egyptian ankh. It seemed so obvious to me that with this conical bottom that the energy was more effectively doing a yin-yang kind of thing…even more so than with the double terminated crystals. With the double terminated crystals it’s as if the energy is flowing in a different direction. When you put the round part of the crystal in your palm or on your body any kind of programming within the body that is not in balance is moved out. The pointed end has more of a directional flow, moving thought to where you want it to go. "It was amazing to me. It seemed to be flowing in both directions simultaneously. Then I started feeling the presence… In all the crystals I’ve worked with before there is the feeling that it is either programmed with thought or that there is a very impersonal kind of consciousness interactive within the crystal and yourself. What it felt like with this particular crystal was that this consciousness was very living, very much personal. The impression I had was of a master of some kind. I had the impression of an oriental Master of some kind, very much into the Buddhist tradition, very much working with healing modalities with this crystal. "I got specifically that he had Marcel’s permission to put specific programming into the crystal and that whatever crystal you cut will have this generic program within it and that Marcel had agreed. It was like his consciousness or someone he is working with, who is also a Buddhist Master, that consciousness was so personal and so interactive. It was mind-boggling to me. "The next thing is that the Pali Canon (a Buddhist scripture) kept coming through. There was a lot of informational content of Sacred Knowledge. This was all coming through within the first ten minutes of picking up the crystal. I got so excited about it that I didn’t even want to let go of the crystal. I didn’t even want to let go of it to go to sleep. I felt perfectly clear, perfectly balanced and perfectly energized. It was like instant healing, instant re-alignment. I didn’t even work with the breath! It’s as if this crystal works without you necessarily doing anything to it. You can use the breath and work with it but you don’t have to, it’s not necessary." "The conical end to the crystal seems to work better for some reason than a rounded end. This was surprising to me because I’ve always seen it the other way (i.e. so-called massage crystals with a more rounded termination at one end). This really feels a lot better (than crystals with the rounded end). I think it actually stimulates (acupuncture or acupressure) points a little more precisely, but not in the way that the pointed end does. If it’s too pointed this would not be good, but this seems to be a really nice balance in that regard. "What really impressed me though was the presence of consciousness…it seemed to be personally inter-active. It felt very personal somehow. It moves the energy very quickly but it’s somehow "self-charging". This was Melissa’s first impression of the Prana crystal without any background information regarding its origins and the connection to Master Choa. This was Melissa’s response to the crystal. The following is Melissa's intuitive or channeled response. "As the collective assimilating at this time we will begin the process. You may start by asking your questions. Q: Can you give us a general impression and your perspective on the crystal that Melissa has? A: There are a number of different relationships between this crystal and the ways in which it may be used. It is primarily a resource for deferring energy or using it to take away thought-forms that are not purposeful to the individual who is aligned with it therefore it can act as a good purification device or a device to make the focus more pure and as you might call empty or devoid of thought. Therefore the normal matrix or the elemental nature of the being using the crystal can more prominently radiate. It is therefore unlike many of the crystals that are amplifying or radiating thought It is a device that is taking away or bringing one into the "voidness" or emptiness that of no-thought. This is the purpose of the mind behind the master program or the ones who have brought the form into being. It also has some inert qualities that could be developed further. These have to do with creating a radiant filament or aspect of the crystal that can determines ones purpose or reason for being This is a cause and effect type of device. In other words when there is a void or an emptiness there is always something arising out of that void. This is something that will create a kind of reaction within each person who works with these tools They will find that many things are removed or eliminated from the environment and their personal biosphere but in turn they might find that they also have more ability to produce or to create new movements in space and time. These are not necessarily the types of space-time movements that we refer to with the other crystalline devices. These relate more to the personal actions of the individual on a more physical plane level. This particular crystal seems to have a great ability to create a form or reality based in the present moment." Q: Is there a particular way that one would use this crystal for another individual? A: Noting the individual relationship to you may have some benefit. There could be some relationship between you and the individual that you bring into awareness of this particular device. In other words, they and you may have specific primary motivations that may be of a similar nature. Whether you are aware of these motivations or not is somewhat irrelevant. Therefore understanding the relationship between you and the individual with whom you are working may be able to bring more into alignment a group consciousness or cohesiveness We would say that this would be the primary way to use this crystal to understand the relationship between you and others whom you are bringing into focus or alignment with it. This would be the only methodology we would suggest in that your own practices and your own means in working with the instrument seem to be more than sufficient to create the results that you are hoping to achieve. Therefore as long as you are in agreement with the individual you are in contact with this is all that should be necessary. More-so from your own standpoint: understand the relationship or the co-operative consciousness." 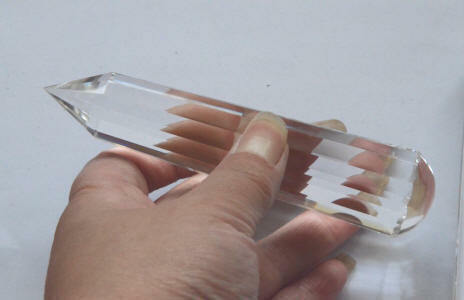 Q: Can you compare this form (the Prana crystal) to the traditional Vogel-cut crystal form? A: There are certain placements within the crystal itself that have a radius that is consistent with Marcel’s (crystal) although there are some new figures within the angles. These relationships therefore have a circumferential stability that is more effective. We are not able to bring this information through correctly, but perhaps if you place some thought to it, we will try to reflect the information to you more directly as your mind has more of the ability to understand the mechanics. We would say to look at the difference between mid-point of the crystal as it is in relationship to the circumference. (Melissa: if I’m seeing this right, if you took the crystal from the tip to the bottom, they’re looking at something almost the midpoint of that and then they’re taking that and pointing at the actual circumference of the crystal. Then they’re looking at something between the actual facets themselves). Q: Can you compare or contrast the overall effectiveness of the traditional Vogel-cut and the Prana crystal? A: There are more similarities than differences. We would say that the benefit of this crystal is that it has the ability to expand the radius around the individual in that it takes the being’s relationship to the crystal and unifies it as a cohesive field. The Vogel-cut crystal is more related to the heart chakra and that the Prana crystal is moving the center down to the solar plexus center and this is creating an expansion that is related to the chi element. It is creating a field that is coming from the midpoint and moving out almost like the facets and you could see the facets like rays of sunlight creating a filed that is moving out It does the same thing within the individual. Somehow it seems to create a field that links the crystal and the individual more comfortably. Q: So the prana crystal links through the hara or tan-tien more and the standard Vogel-cut is more heart oriented. Is that correct? A: Yes, this is correct. The field of awareness that you have allows you to move the energy into he various chakras creating more of a unified energy. However, because of the fact that the Prana crystal is working to move chi, the center point is just focused a little bit differently that the Vogel-cut® crystal. Each is equally effective and both have the element of love programmed or effective within them. The individual who created this crystal also held the thought of Marcel’s mindset as he worked to create the Master program for this form, therefore the Heart energy is very intact within these devices as well. There are certain configurations that create a different focal point or midpoint within the crystal itself. This is both as the result of the level of consciousness as well as certain properties that are programmed with the crystal itself. Q: This particular crystal has eighteen sides. Is it important that it has eighteen sides or can this be changed? A: For the specific use for which it was devised this is the most effective number. There could be crystals cut with different number of planes or faces that would create different realities as well, but for this specific device that is working more to create a resource of prana and of alignment of the basic elements of the person for which it has been programmed, it is effective as it is. We would not recommend any change. Q: Can you say something about the different number of sides on a crystal? A: Generally speaking, the number of sides can create certain types of physical realities. The four-sided crystal has a great deal of ability to create foundational platforms or, in other words, to create a basis or fundamental relationship with things. For example, this would be a good platform to use for manifestation of mind realities if you are hoping to create or manifest a particular thought the four-sided crystal is effective for this. It is a good tool for maintaining form, for maintaining stability, for maintaining or keeping alive a particular thought-form If someone, was using this crystal to amplify the thought of a specific mantra or visualization this could help to stabilize the visualization or thought-form and help it remain intact for a period of time. The six-sided has a capability to create a Merkaba or a type of relationship between to two opposing elements. It creates a type of stability between or a type of balanced relationship between the two. This can be useful in out-of-body travel for example. Or for receiving information from other thought-forms or other entities or other spatial relationships that you may have interest in learning about. These can be both with the self or external to the self in terms of your personal consciousness or expression of reality. The six-sided crystals have the ability to also to nuance or create a reflection of subtle energy or work more with that which is unseen of unfelt. It can create a refinement of a resource within oneself or potential with oneself so that which is not fully developed and be more fully realized. The eight-sided crystal has the ability to create a super conscious or a kind of expansion of awareness. It has the ability to move beyond the mind into a non-linear reality. This is purposeful for soul development as well as clearing away the illusions or delusions of mind. A nine-sided crystal has the energies of the void or the void components that we referred to earlier. It is taking away information. It is eliminating certain components within a field of thought so it is not as beneficial for Melissa in channeling, for example. However, for moving elements out of the environment prior to the receiving of information this is quite effective. You might look at this as a tool to remove disturbing thought elements or from a physical body or field energy itself. This is the type of removal of information of which we speak. Regarding the twelve-sided crystal, the number twelve has a lot to do with creating a causal reality or reality that can have a type of relationship with other individuals with other form based consciousnesses. This is purposeful for the type of mental work that you might want to receive from us for example. A twelve-sided mentally focused crystal is very good for receiving information as well as creating spaces of thought. With a thirteen-sided crystal there is a creator or a being who has the ability to hold thought, to know the unknowable. The thirteen-sided crystal facilitates the ability to hold this within oneself. It is the blueprint of the creator or of the Divine. The twenty-four-sided crystal is a more extensive or powerful version of the four, six or eight sided crystals. It contains harmonics of all of these. The thirty-three-sided crystal has an ability to create a pattern that replicates itself, therefore it is particularly effective for expansion of thought or creating a type of infinite array of information, one that you would wish to be continually reflected or radiated. This, therefore, has a great deal of exponential ability. Q: Does the thirty-three-sided crystal have any particular value in working with water? A: This would be a very good application of this particular crystal.